Sven Nordqvist is the venerable illustrator of the world renowned Adventures of Pettson and Findus children’s books. The Camping Trip is just one of a dozen or so titles belonging to this group. 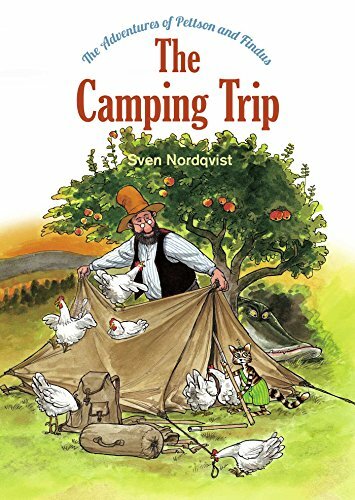 First printed in Sweden in 1992 and later in the U.S. as Findus Goes Camping (Hawthorn 2011), publisher NorthSouth and translator Tara Chace release this current version. Pettson is an old, although he doesn’t appear terribly old, spectacled man in a wide rimmed ten gallon felt hat. He is a tinkerer-inventor-bachelor-fisherman, and a weaver of tall tales. Findus is Pettson’s cat, a wiry tabby donning green zoot-suit overalls held on by a solitary shoulder strap, or perhaps they are fishing waders, in either case it is a curious costume for a curios rambunctious critter. Findus has only to pounce upon a stored-up tent bundle, which is tucked among attic bric-a-brac, and this story is off and rolling. Cat and old man alike show a surprising similarity of personality. They are both desperately preoccupied in their grandiose endeavors. Pettson is distracted by his hoard of mechanical paraphernalia, wanting to cram many objectives—mountain hiking, big lake fishing, invention testing, campfire cooking—into a simple night out in the tent. Findus, though we are told he is waiting for Pettson to get his gear together, is obviously happily having the time of his life, dizzily dancing from one delight to another—spinning the wire on a fishing apparatus, poking at a spider, balancing a ruler on his toes and camping stakes on this front paws and tale, with the manic motion of ADD. And this is all in the first four pages! Off they go but far they aren’t when they are accosted by the chickens who succeed in sabotaging the plan making despite all the fuss and preparation from the first four pages. The tent is pitched in the farmyard and the chickens take over to roost. Pettson and Findus determine to ignore the chickens and head out to test the new fishing invention in a nearby lake. His bow and arrow mechanism scores Pettson the biggest darn fish in the history of pike fishing blowing the hat off of Pettson and scaring the bajeepers out of Findus, but the fish snags away, disappearing along with the ripples of the water. As night falls the campfire glows, the fish caught by the cat roast, the sun sets gloriously melting the valley colors. The chickens have abandoned the scene. Findus is tucked into the cozy bag inside the musty canvas tent under the rustling evening breeze. But Findus has visions of the monster-sized fish coming to eat him and is terrified to sleep outside alone. Pettson is cajoled to spend the night in the tent and Findus finds his way back inside, into the comfy and empty bed of Pettson. In the morning light, Pettson’s nosey neighbor harasses Pettson for his ridiculous location for a tent and gets an earful of tall-tale explanation for why it is there. The old man and his cat conclude the camping trip with a stroll up the hill and a picnic breakfast. The End. The story winds along tangentially: Are they hiking? Are they camping? Are they fishing? Are they managing the chickens? Are they going to sleep in a tent?—there is not really one focused plot point as the reader weaves and wanders. A bit on the wordy side for an early reader, but long on the entertainment side for an eager listener, and there is plenty to look at. Nordqvist’s illustration style is bursting at the seams with character and energy. He takes every opportunity to infuse little surprises under every leaf, in each nook and cranny. Tiny gopher creatures laugh hysterically in the neighbor’s beet garden; a diligent mouse hands one of the hens an egg cup to catch an egg she may be about to hatch; tree trolls are building tracks along the roots to carry away carts of twigs; a hearty Nordic skier slides in to hear closer the tall tale of the tent. And on and on. The more one looks, the more one will see, the more one will be utterly amazed and charmed by this story. Though it is a little disappointing that this is not a new installation to Nordqvist’s collection of adventures, it is still a treasure that will lure a new generation of readers, rendering them life-long fans of Pettson and Findus.